July 1st - Canada Day Celebrations! Happy Canada Day everyone! 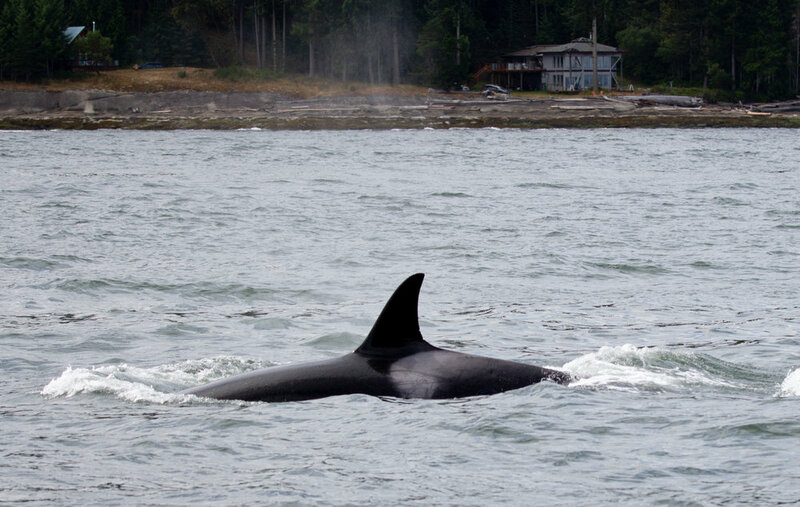 What better way to celebrate our freedom and beautiful land than watching killer whales swim free through the pristine islands of the Salish Sea! The sun was trying to peek out from behind the clouds as we set off the dock yesterday morning towards reports of killer whales not too far away. By the time we arrived we had sunny skies and 9-10 whales traveling fast next to us along the Galiano shoreline. A good travel speed for orcas is 6-7 knots, but these guys were kicking it at 10 knots! We were lucky enough to see not just one pod, but two, traveling close together and often surfacing at the same time. All sizes of fins were mixed together splashing in and out of the waves. The T49A's and T36A's were the two family groups we watched on our morning tours and they had been seen traveling together the day before as well. Two young mothers and lots of youngsters! In the afternoon we got to see a different group of whales, the T65A's, who were travelling through Sansum Narrows towards Maple Bay. We were lucky enough to find them right when they were making a kill! It wasn't so lucky for the seal though, since this afternoon hunt was much more successful than the attempted one in the morning. The T65A's have a young calf with them, the 6th offspring of the matriarch, T65A. If you've been reading our other Recent Sightings Blogs you'll know that we have been seeing a lot of this pod this week. If you want to learn and see more of this little guy check out the blog posts from June 27th and June 30th. The youngest calf of T65A, T65A6, only a few months old! Learn more about this little guy in our previous blogs. Photo by Val Watson. Often when there are young whales in the group the hunts will take longer to give the opportunity to teach the babies about hunting techniques. There was also a lot of vocalizations when we put the hydrophone into the water. The hunt carried on with tail slaps (used to stun the prey), breaching, and fluke waves. We knew the hunt was successful once the seagulls came in to start picking away at the scraps. Big tail slap by one of the T65A's! Photo by Val Watson. The whales must have been feeling the Canada Day spirit because during the hunt they also gave us an amazing show! We saw three big breaches which are always a rare treat. Big splash as the whale hits the water! Also a good look at the size of the pectoral fin. Photo by Val Watson. After the hunt these guys continued with their travels up north and we started our trip back to the harbour. On the way back we stopped at Entrance Island at the northern tip of Gabriola Island to take a look at some sea lions. The sea lions are always entertaining to watch and its a special treat when we get to see the large males. Today continued to be lucky as we saw this guy! Look at the size of this male! Photo by Val Watson. While at Entrance Island we also noticed some movement on the shore of the island and were pleasantly surprised to see a large group of Canadian Geese! It was a very fitting end to the Canada Day trip. What an amazing way to spend Canada Day! July 3rd - T Party near Gabriola Island! June 30th - T65A Family with Baby!